Business activity monitoring (BAM) is a solution that provides real-time tracking of business events, including the tracking of business processes, operational activities, and business situations. The business events that drive business activity monitoring can be sent by a variety of applications and technologies. The collected event information is available in the form of dashboards. 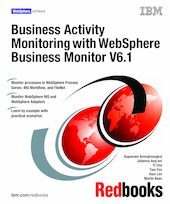 Through step-by-step hands-on examples, in this IBM® Redbooks® publication, we explore how you can use IBM WebSphere® Business Monitor V6.1 to track business events from a variety of applications. We discuss combining WebSphere Business Monitor with process-based applications running in IBM WebSphere Process Server, WebSphere MQ Workflow, and FileNet® P8 BPM to achieve business activity monitoring. In addition, we explore monitoring business events from non-process based applications including WebSphere MQ, and WebSphere Adapters running within WebSphere Enterprise Service Bus (ESB). We also explore how to create a custom event emitter.